The latest release of video tools for Creative Cloud contained over 150 new features. One of these is the new Detail Preserving Upscale effect for After Effects, which enables you to upscale content without negatively affecting quality – no pixelation, no loss of contrast. In fact, this is very closely related to the new detail preserving resize in Photoshop (which I recently covered here). This new feature enables you to be able to dramatically scale content for special effects, or convert low resolution content to HD or even Ultra-HD formats without sacrificing quality. Check out the video below to see it in action. I’ve included two examples of using the Detail Preserving Upscale to convert to 4K Ultra HD. One old/historical video upscaled to 4K, and one is a 1080p video upscaled to 4K. In both of the examples, you will see that there is better contrast and less pixelation in the final upscaled result. Here are some screen grabs from the editing process. The center (small) image is a still from the original source clip at 100% size. The image on the left is resized using After Effect’s normal scale transform, and the image on the right uses the new Detail Preserve Upscale effect. If you look closely, you can see that the image on the left has more pixelation, and there is less contrast in the face. With Detail Preserve Upscale, lights are lighter, darks are darker, and you don’t have pixelation/distortion. If you’d like to see the final result, check out the JFK video below. 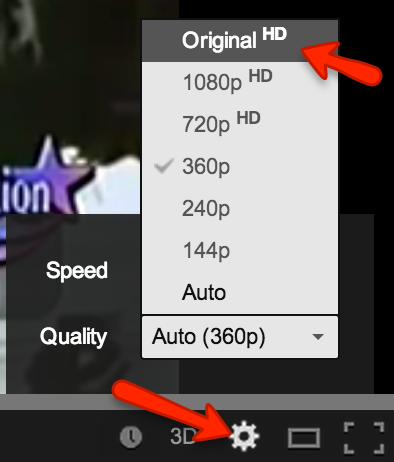 You’ll just need to set YouTube settings to “Original” resolution to see the full size videos, though you’ll need a 4K monitor to see the video at full resolution. In my last post, I talked about masks in After Effects, specifically the new motion tracking feature for rigid masks. In this post, I’m again focusing on video composition, but instead of compositing using masks, I’m going to talk about keying. 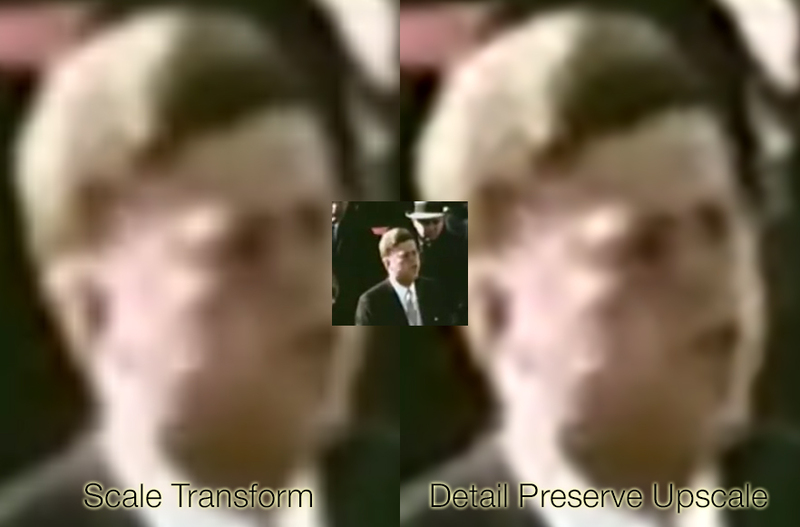 Keying is a technique for selectively removing areas of a video based on content inside of that video, so that there is transparency. With this transparency, you can add layers and special effects to your video compositions. There is color keying, which removes pixels with specific colors from a video, luminance keying (luma key), which removes pixels based on brightness value, track matte key, and more… all of which are just different methods of removing pixels from a video and adding transparency. If you’ve ever wondered how news programs get the weather person to appear in front of an animated weather map, they’re just using color keying/green screen techniques. This is when the subject (the weather person) is captured on a green background, and the green background is removed using color keying. Then you’re just left with the weather person, which can easily be composited/overlaid on top of the weather map. Check out the video below to see two examples of keying in action (scroll down to jump directly to the video)… The first example shows how to use a green screen/color key technique in Adobe Premiere to overlay a subject on a background video. 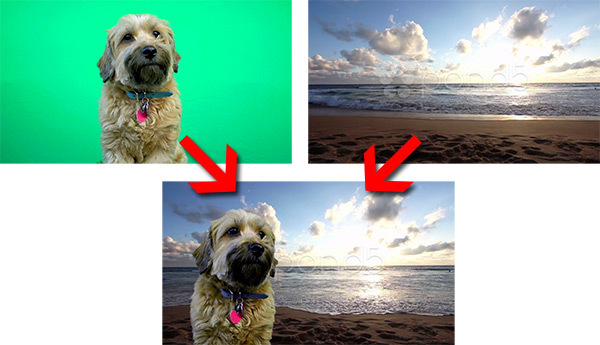 Attribution: Dog Video, Beach Video – You’ll get better results with higher quality video – I just used these for simplicity. The dog video is licensed under Creative Commons with attribution, and the beach video is a preview file from Pond5. 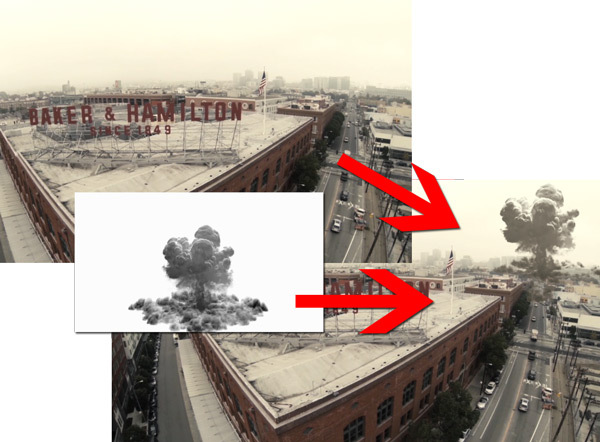 The second example shows usage of color keying to overlay an explosion over a more complicated scene in After Effects – complete with motion tracking, and additional masking to make the explosion look like smoke is billowing down the streets between the buildings. Now, check out the full video to see how to apply these techniques. You already have have everything you need for these within Creative Cloud. If you aren’t already a member of Creative Cloud, learn more and join now at creative.adobe.com. I like to think of After Effects as an animated version of Photoshop – many of the same general techniques apply: selection, masks, blend modes etc… The primary difference being that the content changes over time when working with video. In general, masks work exactly the same as they do in Photoshop – you use the mask to determine which part of the image/video should be a part of the composition, and which parts should be hidden from the final output. Using masks you can selectively determine which parts of the video should get special effects, or you can use them to composite clips from multiple videos together. You can animate these masks on the timeline, and that mask will be animated in the video. Note: Not to be confused with Keying or Rotoscoping, which I’ll be covering in subsequent blog posts in the very near future. You don’t have to use the Rigid Mask Tracker, you can still animate things manually, but this new feature makes applying motion to masks incredibly easy. Pay attention to the fire truck in the screen capture above (and the video below). I’ve made the fire truck stand out from the rest of the video using a mask that was drawn over the fire truck, and employed the Rigid Mask Tracker to automatically track motion of the fire truck in the video. The top (masked) video layer has increased saturation to make the reds brighter, and the bottom video layer has decreased saturation to remove colors. Now, take a look at the video below to see how this was done and see the final output! It really was as simple as the steps I mentioned above. Just draw the mask, analyze/track motion, apply effects, and you’ve got it! Now, go get out there and create great things! If you aren’t already a member of Creative Cloud, lean more and join now at creative.adobe.com. 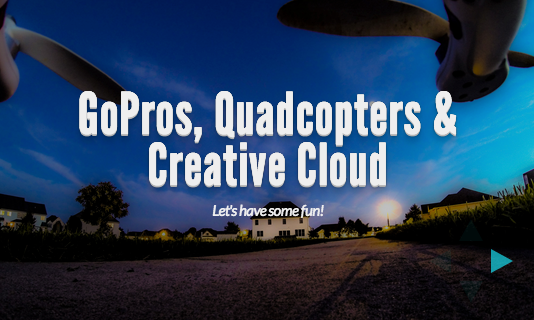 Last week I had the opportunity to present an incredibly fun topic to the DC/MD/VA Creative Professionals user group… GoPro Cameras, Quadcopters, and Adobe Creative Cloud. Thanks to everyone who attended. This topic is a personal interest of mine, and I had a great time. There were great questions and great conversations all around. Attribution: I included some images from the GoPro photo of the day gallery. FPV: KumbaCam – Great for a remote viewfinder, though the GoPro feed flickers when in time lapse photography mode. I put it on a tripod at eye level so I can quickly glance between LOS and FPV viewing (FPV = First Person View). I use this as a remote viewfinder, not a primary flight mechanism, and never go beyond line-of-sight. Batteries – get lots of extras b/c you won’t want to stop flying! Without the gimbal and FPV, you’ll get about 12-15 mins of battery per flight. With the gimbal and FPV, I get about 7-8 minutes per flight… I’m currently researching options to extend battery life & flight time. You can definitely get bigger copters with a heavier lift capacity, but this configuration is great for getting started, and is designed specifically for the GoPro. Then, use Creative Cloud to polish your images and video. Here’s a quick video I put together showing how to create incredible panorama images in ten easy steps, using Adobe Photoshop CC. I captured this one on Monday in a sunrise session in Richmond, VA with a DJI Phantom and GoPro. All made possible by Adobe Creative Cloud. If you’re not a member, become one today to get the best creative tools possible!